Home » Intraday » No Turnaround Edge This Tuesday? It’s been the day session. 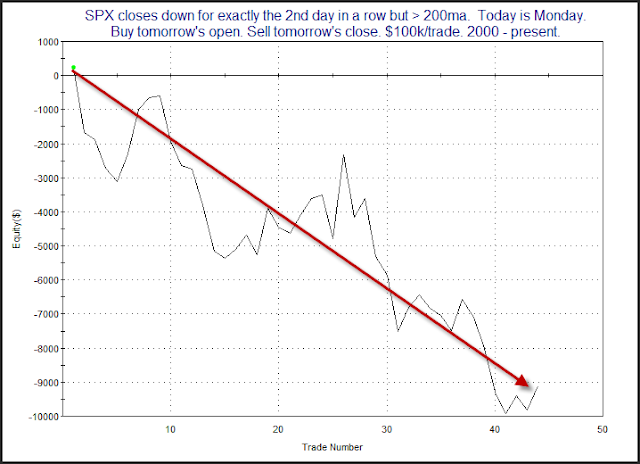 Below is a are the results of going long Tuesday morning after a 2-day pullback during an uptrend, and then exiting at the close. A bit choppy, but it has been headed lower for a long time. Traders may want to be a little cautious about jumping aboard the “Turnaround Tuesday” train today. The market has historically struggled between open and close under similar scenarios.